The 30-share Sensex ended down 604 points at 28,845 and the 50-share Nifty ended down 181 points at 8,757. 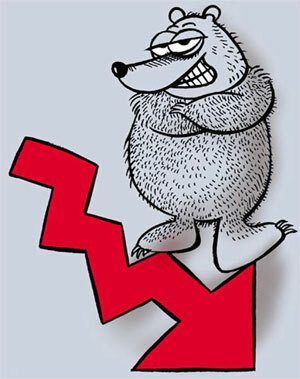 The Bank Nifty ended down 602 points at 19,146. The BSE Sensex and Nifty fell more than 2 per cent on Monday, their biggest single-day drop in two months, on increased expectation of a rate hike by US Federal Reserve following stronger-than-expected jobs data. Further, fears of foreign fund outflows in the short term amid sooner-than-expected hike interest rates by the US Fed in wake of robust jobs data also dampened sentiment. The 30-share Sensex ended down 604 points at 28,845 and the 50-share Nifty ended down 181 points at 8,757. The Bank Nifty ended down 602 points at 19,146. “Two factors determined the market fall first the weakening Indian rupee and the surprising rise in bond yields which would impact the mark-to-market value of securities for banks and secondly the March factor wherein institutions unwind their positions. Information technology stocks witnessed selling on the back of muted guidance from TCS,” said Deven Choksey, MD & CEO KR Choksey Shares & Securities. Meanwhile, foreign institutional investors were net buyers in equities to the tune of Rs 80 crore on Friday, as per provisional stock exchange data. Further, the Indian rupee was trading sharply lower to the US dollar after the greenback rallied against other currencies on expectations of that the US Fed would hike interest rates sooner-than-expected. The rupee was trading lower at Rs 62.59 compared to the previous close of Rs 62.16 on Thursday. Asian markets were trading sharply lower tracking losses on Wall Street after robust US jobs data. Among the major indices, Nikkei ended down 1% while Straits Times, Hang Seng were down 0.2-0.4%. However, China’s Shanghai Composite ended up 1.9% after data showed that exports gained pace in the January and February 2015. European shares were also trading weak after the sharp fall in US stocks while decline in exports from Germany during January also dampened sentiment. CAC-40, DAX and FTSE-100 were down 0.1-0.6% each. BSE Bankex was the top sectoral loser down 2.6% followed by Power, IT and Capital Goods among others. However, Healthcare index was the sole gainer up 0.5%. Private lenders witnessed profit taking after sharp gains post the Budget proposal of fungibility of FDI and FPI which would allow private sector lenders to raise additional foreign capital. ICICI Bank, HDFC Bank and Axis Bank ended down 2.4-4.3% each. IT shares also witnessed profit taking despite the weakening rupee after TCS flagged that growth in the March quarter would remain in-line with last year trend adding that cross currency headwinds would impact rupee revenue by 275 basis points and dollar revenue by 200 basis points. TCS ended down 2%, Infosys slipped 2.7% and Wipro ended down over 1%. Other index heavyweights that witnessed profit taking include, Reliance Industries, ITC, L&T and mortgage lender HDFC. Metal shares were also trading lower on fears that higher rates paid to acquire coal mines would hurt margins going forward. Hindalco ended down 4.7%. The company won the bid for Dumri Coal Block at Rs 2,127/tonne. Sesa Sterlite ended down 5.2% while Tata Steel eased 2%. However, Hindustan Unilever ended up 3.8% on defensive buying. Sun Pharmaceutical ended marginally up by 0.4% after the company today said that the Hon’ble High Court of Punjab & Haryana has on March 09, 2015 orally pronounced an Order, approving the Scheme of Arrangement involving merger of Ranbaxy Laboratories Ltd. with the company. In the broader market the BSE Mid-cap and Small-cap indices ended down 1-1.3% each.